Please note the NEW ITEMS on this page. 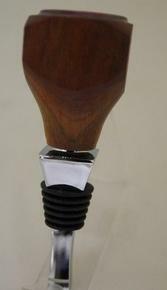 These photos are of items that may be available in the store. If the one you want is not in the store please CONTACT US and let us know which one you want. The photos may also prompt thoughts for a personal design, so please CONTACT US for a custom order and consultation. 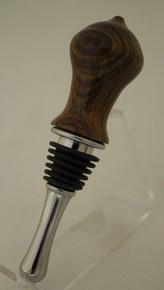 The above wine stoppers are made of cherry and walnut, both domestic woods. They each have different shapes making them a one of a kind. As they are turned the interesting grains appear adding to the uniqueness of each stopper. 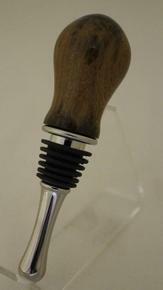 The metal is stainless steel making them safe for wine etc. 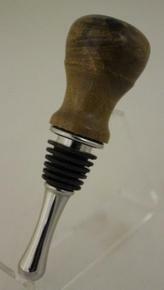 The cork is flor cork which is the finest grade of cork available. The above wine stoppers are made from exotic woods: Blooedwood, Canary wood, Panga Panga, Pau Amarello, Purpleheart and Zebrawood: domestic woods: maple and walnut. 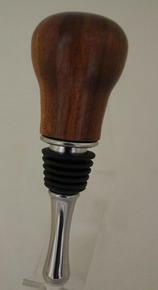 The design occurs with the placement of the woods and the grains as they are turned. 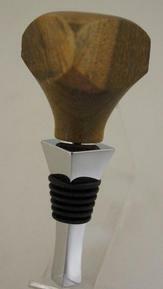 The unusual shapes also add a good deal of interest. 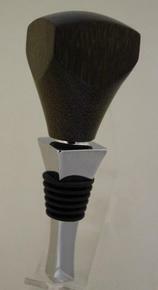 The metal is stainless steel making them safe of wine. 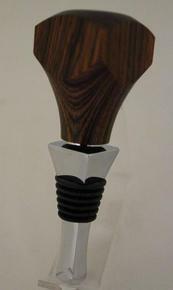 These corkscrews are handcrafted from exotic woods: Canary Wood, Pau Amarello, Purpleheart, Zebrawood; and domestic woods: maple, white ash, walnut and red oak. 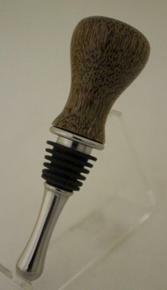 The position of the woods and the grain as it appears when turned with the different shapes create a one of a kind corkscrews. 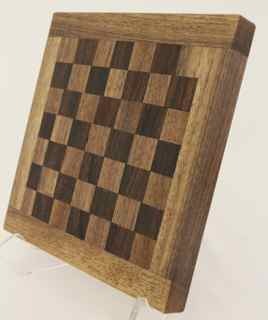 These cutting boards are great in the bar! 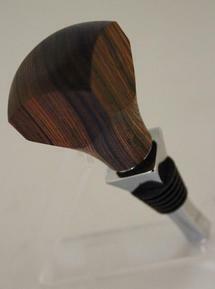 Each one contains 8 pieces of exotic woods: Canary wood, Olive wood, Pau Amarello, Purpleheart, Wenge, and Zebrawood. 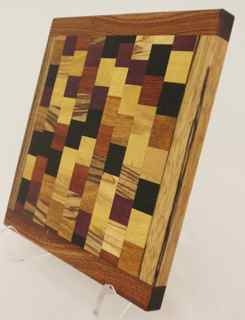 The placement of the woods and the grains produce the very interesting looks. Also the arrangement of the woods affect the look of the board. 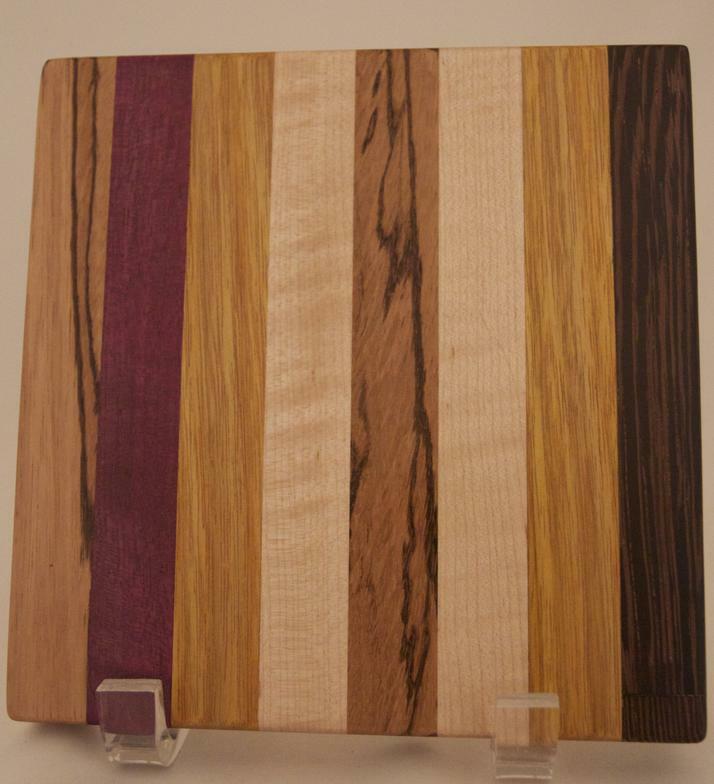 The cutting board on the left is made of Cocobolo an exotic wood and walnut a domestic wood. 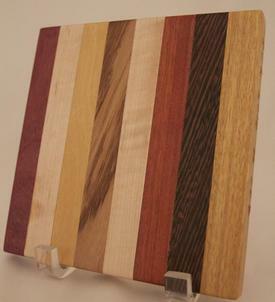 The center and right cutting boards are made of Bloodwood, Canary wood. 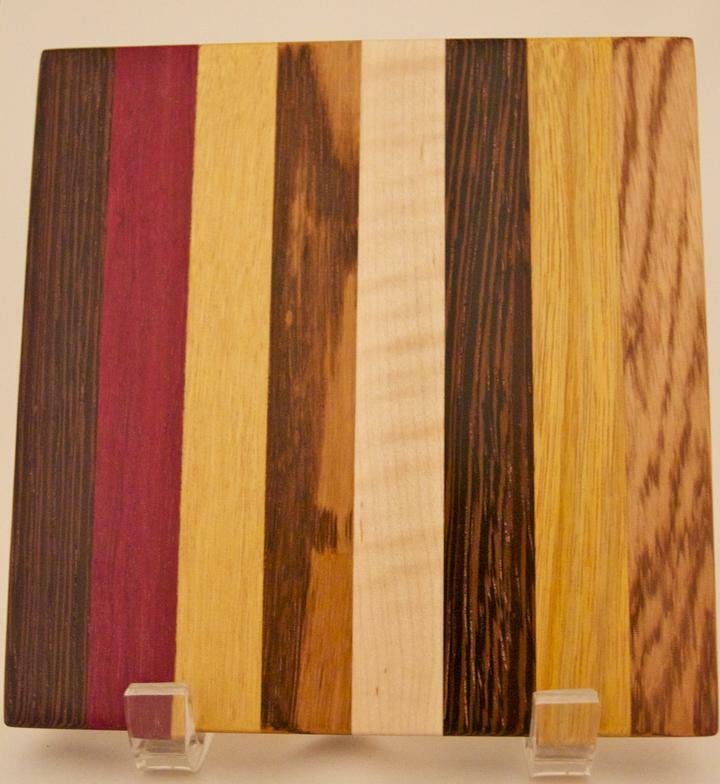 Olive wood, Pau Amarello, Purpleheart, Wenge, and Zebrawood. These boards are a great size for the bar. These bottle openers have chrome plated metal. 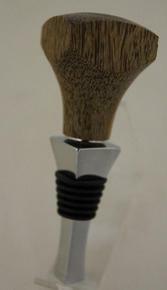 The handle on the top left is Tulipwood, the other is Canary wood, both exotic woods. On the bottom far left is Black and White Ebony, center is Bocotoe, both are exotic woods. The far right is Walnut, a domestic wood. 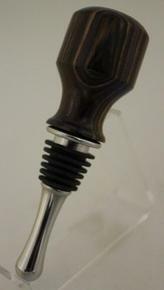 Each handle has been hand turned with different shapes to accent the unique grain of each wood. 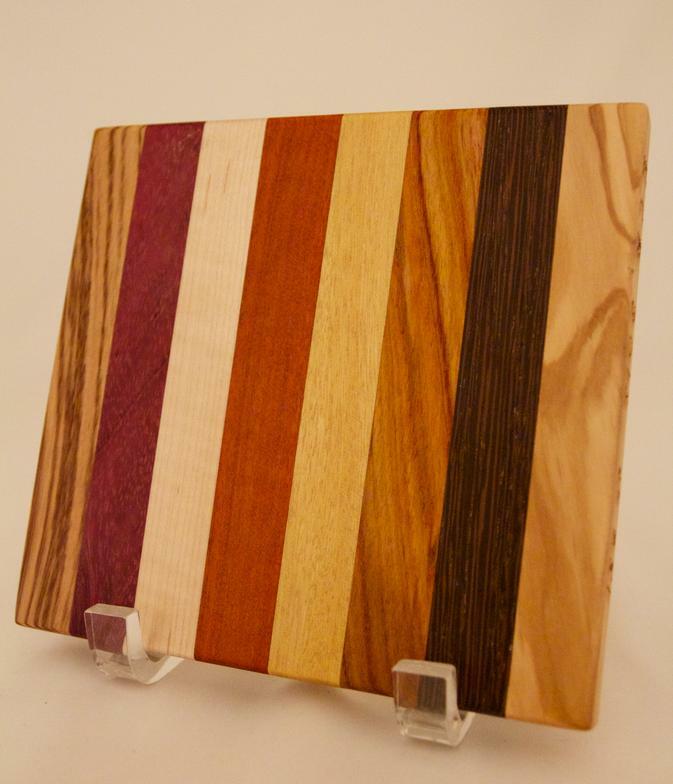 The colors are unique to each wood, they have NOT been dyed. They are top to bottom right: 1.125"dia x 5.25", 1.125"dia. x 5.75"L, 1.25". x 5.5"L.
All the bottle stoppers above have a chrome plating and flexible silicone ring stopper. 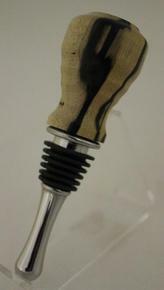 They fit most wine bottles. The woods are exotic woods. 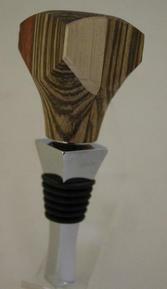 Each has its own distinctive grain pattern making them unique. 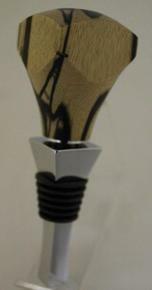 They are approox 1.75"dia x 4.5"L. They are $35.00 each. 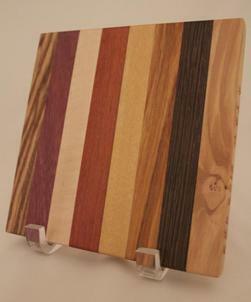 New Cutting Boards are here. 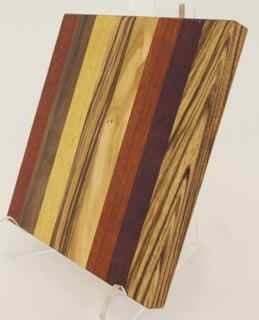 The ones above contain exotic woods: Black Limba(Africa), Bloodwood (S America), Bubinga (Africa), Canarywood (S America), Katalox (C & S America), Olivewood (Euroupe & eastern Africa), Padauck (W Africa), Panga Panga (Africa), Pau Amarello ( Central America), Purpleheart (C & S America), Zebrawood (Africa). They have a food safe finish. They may be washed with soap & water, but not put in the dishwasher. If the board appears dry, apply mineral oil. The size, approx. 5.5" x 5.5" makes them perferct for the bar for limes, lemons etc. They are $30.00 each.